I am a huge fan of Robin Robertson’s cookbooks. Her recipes always turn out fantastic, and her cookbooks are all written in an approachable and thoughtful way. 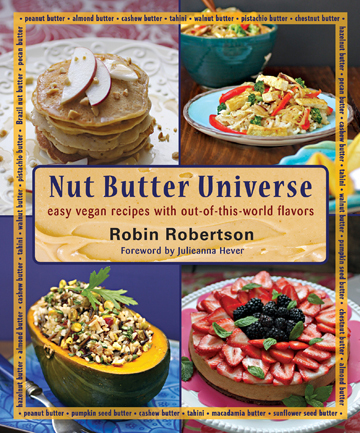 I have several of her books at home and use them often, so when Vegan Heritage Press sent me her latest release, Nut Butter Universe, to review on the blog, I was excited to see if it would measure up to her other books. Nut Butter Universe contains more than 100 completely vegan recipes, all of which incorporate some kind of nut butter to impart a richness and depth into each dish. In most of the recipes, the addition of nuts allows the need for added oil to be significantly reduced or eliminated, creating an alternative for those seeking to reduce “bad fats” in their diet. The first section of the book includes recipes for making basic nut-based items, like cashew sour cream, tahini and sesame butter. These recipes can either be used on their own, or incorporated into other recipes contained in the following chapters. If you want soup, you can make Robin’s cream of chesnut soup or her artichoke-walnut butter bisque, or any of the other 10 soup recipes inside. There is a wide array of dip and spread recipes here, like smoke and spice almond hummus, as well as salads and side dishes, which include roasted sweet potato salad with almond butter and curried cashew chicory fritters. Main dishes include a szechuan stir-fry with fiery peanut sauce and linguine with Thai pesto and, if you’re in the mood for sandwiches, there’s a recipe for peach-almond butter quesadillas and roasted eggplant pita with garlicky lemon-almond sauce, among others. Breakfast and brunch items are also included, so there’s a recipe for ginger-walnut scones and apple-almond butter pancakes inside, as well as some desserts and treats, like pistachio butter biscotti and orange decadence chocolate-almond truffles. Needless to say, I had a hard time deciding what to make first, but ended up choosing Robin’s Indonesian Eggplant with Peanut Sauce. The recipe and method looked simple yet decadent, and I had every ingredient that it called for already on hand. This dish is served with a satay-like sauce which delivers a little kick of heat (the recipe calls for 1/8 teaspoon of cayenne, but I used a sliced Thai chili instead), which is then poured over the baked eggplant to produce a gorgeous and delicious dish. I loved how this recipe created so much flavor from only a few simple ingredients. I am excited that the publisher has kindly allowed me to share this fantastic recipe on the blog. Robin has created another great theme and concept here, and I look forward to trying out more recipes from this must-have cookbook. 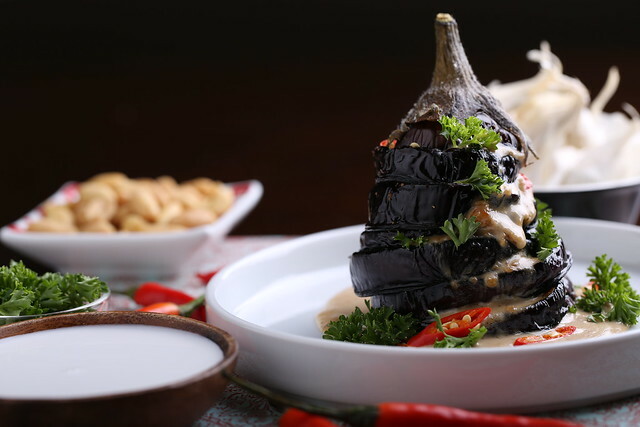 In the classic Indonesian dish, called Petjel Terong, the eggplant is usually deep-fried. 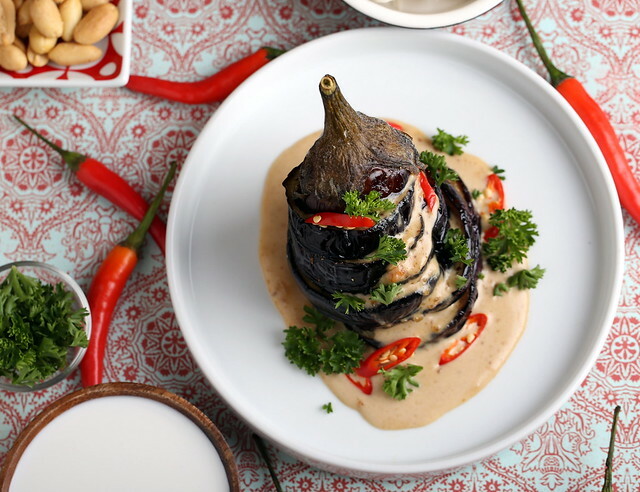 In this healthier version, the eggplant is baked in the oven with a small amount of olive oil. The creaminess of the coconut milk and the peanut butter are heavenly. As a side dish, this serves 4, but will serve 3 as a main dish. Preheat the oven to 425°F. Halve the eggplant lengthwise, then cut each half crosswise into 1/4-inch-thick slices. Arrange the eggplant slices on a lightly oiled baking sheet, brush them with the olive oil, and season with salt and pepper to taste. Bake, turning once, until softened and browned on both sides, about 15 minutes. Hi, Erin! I just made this dish tonight. I love how simple it comes together and still looks as visually appealing with little effort, and is as delicious as it is visually pleasing. I also added a can of chickpeas to the sauce to make it a full meal with protein and served with a side of pine nut couscous. This was great! Thanks as always. Oh, and by the way–I just found a FB group for other vegans here on Okinawa! I was thrilled! (I thought I was the only one…seriously:) We are now planning a pot luck for the end of April to share our favorite dishes. So…I will be pouring through your recipes to plan my portion of the menu! Yes, Isn't Robin the best?! I hope you enjoy the meetup! It's certainly nice to dine with all vegans. I never do, except for a few nights ago, with two other friends and it was nice to share everything and just have vegan stuff on the table! Good luck with the planning — I am sure you will whip up something tasty and memorable for the group! I love to hear that! Thanks for your very kind words. Robin's recipe was really fun to set up and shoot!